Many of you are using a strategy session incorrectly. Follow these 5 steps to make sure your strategy session isn't a waste of time. Have you had a major strategic breakthrough this year? If your answer is “no,” you will get a lot of value from what I will share with you today. In this post, I will share with you the importance of strategy, a basic framework for running your strategy session based on our process that I’ve never shared anywhere else. Strategy sessions can solve problems, as well as spark ideas and innovation that lead to business success. At its core, it’s about making decisions that position your company ahead of your competition. Making these decisions is hard work, and it doesn’t typically fit in with all the other work on your to-do list. Based on my experience, too few have a clear and compelling strategy in place. Many are stuck in sales and marketing tactical hell. A strategy is often broken into ineffective subsections that focus on plans and tactics. No wonder you struggle to define what your strategy is and why you’re most likely not setting the sacred time aside to discover some strategic insights. When you get stuck writing emails or trying a laundry list of tactics you read online rather than spending time in a strategy session, you’re slowly killing your career, department, or business. Strategy helps you bring about the intellectualization of your business. A strategy is a linchpin for how you think about doing business. Before we outline the steps to run a strategy session, let’s get on the same page about the definitions. Take the Mayo Clinic versus a normal local research hospital. The local hospital typically focuses on providing good service, which is probably very similar to your focus. Meanwhile, the Mayo Clinic is significantly different. Their focus is on transforming the world of medicine and being a leader in medical research, and they are. Much like the Mayo Clinic, the heart of your strategy must be to be the best. This drive will rush through the choices you have to make. To help with clarity, here’s a framework for strategy, which we will use while running your strategy session. Integrate the following: aspiration, where to compete, how to be the best, your capabilities, and systems. Most of these falsely labeled strategy sessions are reactive sessions. A strategy session is where you make decisions on how you will win while taking into account each step of the strategy framework. Our intent is to provide you with a do-it-yourself guide to running a strategy session. By following these five interrelated questions, you’ll be able to make the hard choices for your organization. You can follow these five steps in running your strategy session whether you’re a team leader or a salesperson in a Manhattan store. What is your purpose, your motivation? This first step is about your ideal future, and it frames all other decisions. Ultimately, you’ll want to connect the aspiration to specific benchmarks that enable you to measure your progress toward the ideal future state. These aspirations can be revised and improved over time. However, they aren’t meant to be changed from day to day. The aspiration will broadly define the scope of your activities, and the next two steps define the specific activities. Where you compete and how you can become the best are tightly connected and are the heart of your strategy session. This is where we begin to narrow our focus. Here you choose the sandbox where you can achieve your aspiration, narrowing the competitive field and your ideal targets. You can’t be all things to all people. You want to compete where your core strengths will enable you to be the best. How will you be the best? You’ve chosen your battlefield; how to be the best will provide you with choices for winning on that battlefield. Here is where you define your recipe for success. You’ll decide what will enable you to create unique value and sustainably deliver that value to your ideal buyers. Michael Porter called this competitive advantage the specific way your company will create superior value for your consumer, customer, or client and, in turn, create superior returns for your company. There are many ways to be the best, and because contexts differ significantly, there is no single, simple way to be the best. During your strategy session, you will need to think both broadly and deeply, in the varying contexts available to your company. The most important element of being the best will depend on how you delight customers in a unique way. What are your capabilities, and what else is needed to succeed on this path? Capabilities are the map of activities and competencies that enable you to be the best on the battlefield you’ve chosen. You must identify what capabilities you have and what else is needed to support this strategic path. Many of your capabilities might be strong, or some might be non-existent. You may need to look outside your company and outsource to be successful. You will need all of your capabilities to support and reinforce one another. What are the systems and metrics that empower your capabilities? Systems are notoriously neglected and without them, you will not be able to ensure your strategy will work. The final step in your strategy session will focus on systems that foster, support, and measure the outcomes. These will vary based on your aspirations, the choices you’ve made in the areas to compete and the path you regard to be the best. Overall, even if you have the previous four steps, you will fail if you don’t have systems that will sustain over time. The beauty of systems is that you don’t have to depend on the willpower of people. Your systems are impervious to willpower and will just keep working. Additionally, once you get them running properly, you can continue to benefit from them for a long time. Create a Google Doc (Word or Pages) with a Title header of Strategy Retrospective. Purpose: Evolve, improve, sharpen, and stay competitive, and ultimately achieve our business aspirations. Objective: To identify new business opportunities and areas for more strategic input; market knowledge, digital, planning, creative etc. List each topic and sub-topic with the corresponding speaker/attendee and allocated speaking time. Being this detailed will help provide structure to the conversation. Strategic thinkers often drift beyond achieving the desired objective, this will keep them focused. End the call with Next Steps or Action Items. Make sure to assign these to a specific person with a due date. No strategy lasts forever. You will need to make strategy sessions a common practice so you may continue to evolve, improve, sharpen, and stay competitive, and ultimately achieve your aspirations. You need to see this as a process rather than a result. Yes, a strategy session can be risky. When ran poorly, it can weaken your team, create distractions, and set unrealistic constraints. However, if you follow the above framework, you’ll maximize the efficiency and momentum of your strategy session. P.S. Many of you think that in order to grow your business, you have to work harder and harder to bring customers in the door. But this isn’t always the case. 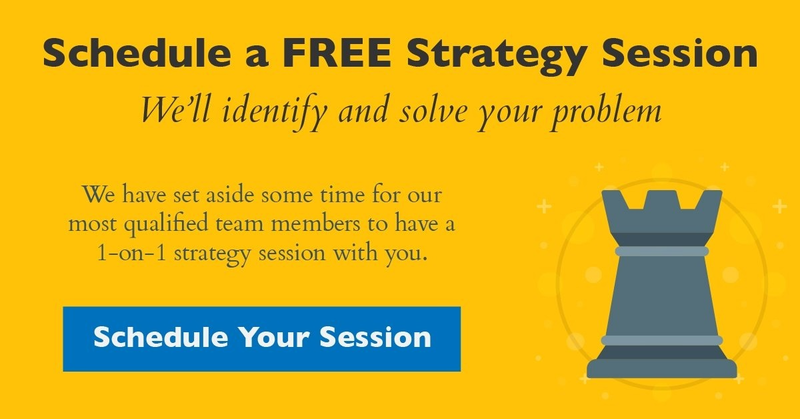 Take advantage of our free strategy session. We have set aside some time for our most qualified team members to have a 1-on-1 strategy session with you to help you discover ways you can get more customers and profit.